“It’s obvious,” said Coughlin, who’s in charge of all football decisions for the Jacksonville Jaguars. But Coughlin also staunchly defended Jacksonville’s run-first, defensive philosophy by saying the team’s offensive woes have more to do with a lack of explosive plays than its ideology. 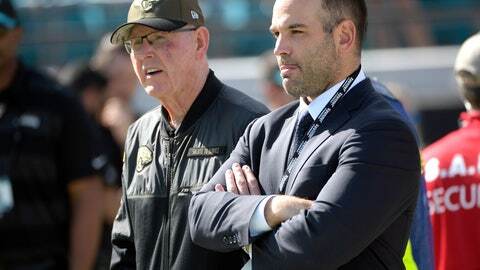 And while Coughlin didn’t point the finger at quarterback Blake Bortles, the Jaguars executive vice president of football operations made it clear during a radio interview Tuesday that Bortles’ struggles have been a significant part of the team’s failures in 2018. “Our formula a year ago was play great defense, run the ball and do a superb job of play-action pass,” Coughlin told 1010XL during the station’s Jay Fund charity event. “Obviously I still believe in that very much, but you have to … if you’re going to rush the football, you’ve got to have the explosive plays. Coughlin, general manager Dave Caldwell and coach Doug Marrone have been widely criticized for the team’s shortcomings. They signed Bortles to a three-year, $54 million contract in February, missed in free agency with high-priced guard Andrew Norwell and receiver Donte Moncrief, and used their first six draft picks in 2018 on players who have made little, if any, impact this season. Coughlin has declined multiple interview requests this season, but spoke on the radio as part of his charity event. He stood by the offseason moves based on how last year ended. The Jaguars advanced to the AFC championship game at New England and had a 10-point lead in the fourth quarter before stumbling down the stretch. One of the key plays was linebacker Myles Jack’s fumble recovery, which officials blew dead and eliminated a potential touchdown return. “We were a whistle” away, Coughlin said. “We’re a whistle (and) we’re in the Super Bowl. And that’s my position, OK? “So tell me, everyone out there, what they’re going to do in that circumstance about your football team. Aren’t you going to fill other pieces in and try to be as good as you can be? And we tried, didn’t we? Well, the nature of the game got us, so we go back to the drawing board. But I’ll put the gloves on with anybody that wants to talk about what” went awry. Coughlin pointed to a number of issues: sacks and quarterback pressures being down, turnover margin being flipped and countless penalties. The Jaguars (3-8) fired offensive coordinator Nathaniel Hackett and benched Bortles on Monday following the team’s seventh consecutive loss, and more changes are expected.